The dorkbot global network is made of groups of people "doing strange things with electricity". There are more than 100 groups worldwide, who meet at various intervals and present work in progress, experiments, hacks and other unexpected uses of technology. Members of dorkbot groups include artists, engineers, designers, musicians, hackers, curious types, no robots yet. More details about dorkbot here and there. dorkbot Cardiff is also on facebook and youtube. 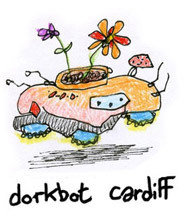 It's been a while since the last dorkbot Cardiff night in March 2014. Any takers for programming #17 ? The nice people who run the Abacus, by the station in Cardiff, would lend us a room. Videos of the presentations are being posted on dorkbot Cardiff's facebook page. Check dorkbot Cardiff's facebook page for video documentation.